Did you know that by age 80, more than half of all Americans have a cataract or have had cataract surgery? Cataracts are a normal part of the aging process and are the leading cause of vision loss in adults 55 and over. Cataract surgery is one of the safest and most effective surgical procedures. In fact, more than 3 million cataract surgeries are successfully completed in this country every year; making it the most commonly performed surgery in the U.S.
A cataract is a clouding of the natural lens inside the eye. This lens works much like the lens of a camera by focusing light images on the retina, which sends images to the brain. When this lens becomes cloudy it prevents light and images from reaching the retina. This results in blurred images, dulled colors and glare; making it difficult to read, drive, and perform manly daily functions. Vision with cataracts has been described as seeing life through a cloudy film; but a cataract is not a film over the eye, and neither diet nor medications will make it go away. When a patient’s lifestyle is affected, the best way to treat a cataract is with surgery that removes the old, clouded lens and replaces it with a new, clear artificial lens implant to restore vision. How Do We Treat Cataracts? The only way to treat cataracts is through surgery. When the patient and surgeon decide it’s time for cataract surgery, the cataract is surgically removed and replaced with a clear intraocular lens (IOL). At Coastal Eye Institute, we use an advanced surgical technique called phacoemulsification, which uses a tiny incision and usually does not require stitches or a patch after surgery. The cataract is broken apart using ultrasound before it is gently removed. The lens implant is then inserted through a small incision and unfolds once inside the eye. This technique allows the eye to heal more quickly with minimal discomfort and usually takes less than 15 minutes to complete. Patients who have the surgery in the morning are usually home in time for lunch and may watch TV the same day. One of the important decisions that you will need to make together with your surgeon is what type of lens to implant during cataract surgery. Until recently, the only option for patients undergoing cataract surgery was a traditional single focus lens implant. Single focus lenses can provide good distance vision or good near vision, but not both. Thanks to advances in lens technology there now exists advanced lenses that can provide a more continuous range of vision. Patients who choose advanced lenses enjoy a wider range of clear focus close-up, at a distance and in between. These lenses may reduce or eliminate your need for glasses. There are different types of advanced lens implants to meet individual needs. Your surgeon will discuss a customized treatment plan and help you chose a lens implant that best serves your visual needs and lifestyle. If you or someone you know if suffering from cloudy vision or cataracts, contact us today. 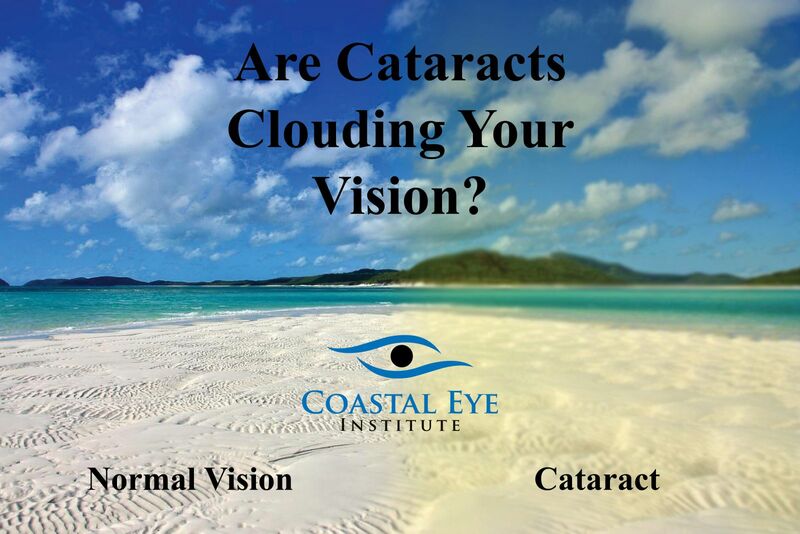 There are five outstanding cataract surgeons at Coastal Eye Institute who are helping to restore clear vision to their patients.